Dozens of published posts on Facebook every week, hundreds every month and thousands every year. This is how all 365 days of a Social Media Manager play out. It is not different also in our agency, where each team member manages an average of 5 Facebook pages. In addition to tracking the discussion under each post and responding to direct messages or comments, content creation makes up the largest part of our work. And it is not at all easy. In this era of information overload, it is a superhuman task to attract the attention of users on Facebook. In the News Feed, every post has to manage it in less than 2 seconds. Brand content must, therefore, be original, specifically tailored to the audience, and most of all, eye-catching. However, to meet these criteria, each post creation requires time. Therefore, it is important to save time where you can. 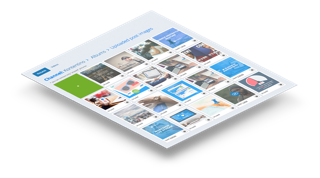 One of the tools that help us save time that we use every day at work is Kontentino. Its biggest advantage is a particularly simple user interface, which caters even to social media beginners. After the registration, you only need a few minutes to orient yourself among all the offered features, connect your account with one of the Facebook pages that you manage and jump straight into the creation of your very first post content plan. 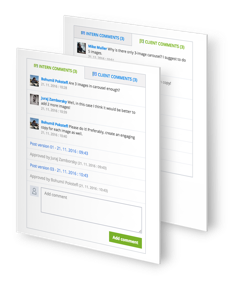 If more of you are collaborating on the same content, whether you are graphic designers, copywriters or translators, the entire post creation process can be accomplished easily thanks to internal comment system in Kontentino. For example, if I need to edit the visuals, I can assign the post to the graphic designer and write down what needs to be changed in the comment. If I need to translate an approved post into another language, I will simply assign this task to the translator. 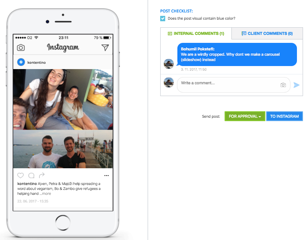 Once the assignment is complete, each member of the team can mark the job as completed, which means that the post can be exported to the relevant Facebook page. A common nightmare situation of every Social Media Manager is having their painfully created posts approved by the client. Thanks to Kontentino, at least you don’t have to rely on a never-ending e-mail chain. You can also forget having to create screenshots of scheduled posts and excel spreadsheet with a publication schedule. 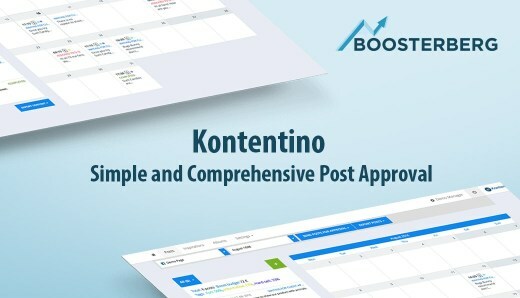 In Kontentino, the client can see all scheduled posts in a simple calendar, exactly the way they will be published on Facebook. With the ability to comment on each post, he can send feedback or praise and at the same time approve the post for publication or send it back to the Social Media Manager for a redraft. For all of this, email notifications can be turned on, but thankfully also disabled. Kontentino support help desk really deserves an enormous amount of praise. If I have a problem or any question, I usually take advantage of the live chat on their website. Within minutes, I hear back from one of the support staff members who review my request and proposes a solution. If I have any feedback or an idea that would improve the product, I usually throw that into the chat and they always are (or at least seem) thankful. Thumbs up! 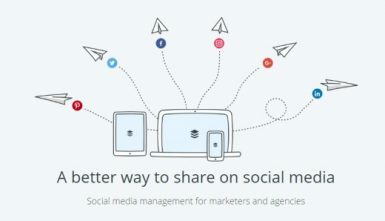 Could Something Make Social Media Marketers Even Happier? On the other hand, in our long-term use of Kontentino we also encounter several shortcomings. Perhaps the biggest is the mobile app. Although it can be easily found in both the Apple App Store and Google Play Store, it is far less usable than its desktop counterpart. The iOS version, for example, offers only basic schedule review features and notifications. You can not create, edit, comment or even approve proposed posts, which is a shame because it really limits the usefulness of the app, relegating you to do almost everything on the desktop. According to the Kontentino support though, a new mobile app that should enable most of the features is imminent – we will have to wait and see. Further drawback arises from the overly simple user interface. Because Kontentino developers tried to create a very lightweight tool without any clutter in its UI, even though there are many useful advanced features in Kontentino, you can’t always find them. Some of them, like deleting or copying messages and moving them to another content plan, are buried deep into multiple sub-menus, which can annoy even advanced users of the tool. At least the help desk is always willing to help you with any feature inquiry. 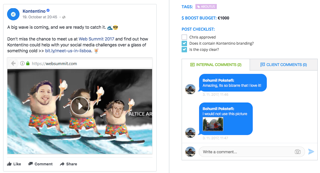 One thing that is a bit wonky is the functionality to tag users or Facebook pages in post copy, a feature which we use quite often in our content. It works, but sometimes you have to try multiple times and it’s not as seamless as the native Facebook solution. Kontentino makes regular changes to its features, and this can also bring frequent bugs, that, although usually fixed within a few days, can sometimes surprise you, especially in a tool that you need to use every day. In addition to Kontentino, we tried also other similar tools, Zoomsphere and Sprinklr come to mind. After comparing them to Kontentino however, we mostly agreed that on the whole, it is much faster and easier to use, which is really the point of such publishing tools. Even if you manage your FB page and most of your work time consists of content production, Kontentino is definitely our recommended solution. In addition to ease of use and time savings, this tool will help trim off a lot of clutter from your email inbox.